Roy Pearson isn’t coming back to the bench any time soon. The latest chapter in the “pants lawsuit” saga dealt the former judge another blow. Federal judge Ellen Huvelle tossed out Pearson’s wrongful termination claim. 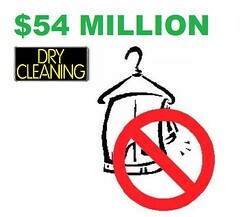 Pearson had sued to get his job back as an administrative law judge after being fired thanks to his obnoxious and overly nasty $54 million lawsuit against a local dry cleaner. “This case is a classic example of a plantiff pleading himself out of court by alleging a host of facts that only serve to totally undercut his claims,” wrote Huvelle in her opinion. While we can only hope Pearson will just go away at this point, no doubt he’ll find some reason to appeal the decision.